For my last workshop before I brought down the shutters for a month or two, the vote from a private group was for sunny summer stuff from around the Mediterranean. To start with we made a gazpacho de fresones, a nice twist on the classic gazpacho from chef Anton Canelles, formerly of Restaurant Senzone at the Hotel Palau del Mar in Valencia. Instead of just tomatoes/garlic/onion/pepper/cucumbers, this one also has strawberries. 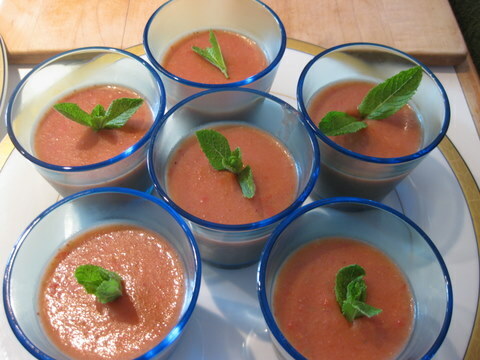 They give the gazpacho a hint of sweetness to compensate for our miserable, northerly, greenhouse-grown tomatoes, without letting things go in the direction of a dessert. To go with it we did focaccia, made from a simple dough that doubles up as pizza dough, quick to rise and easy to shape and bake. 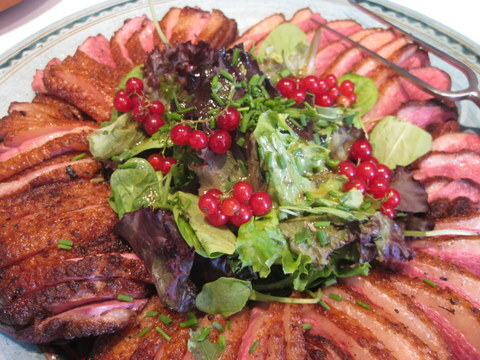 Duck breasts came next, seared first in the pan and then baked at a mere 80 degrees C – just warm enough to cook them to a delectable rosé-rare colour (about 1 hour for 350-450g breasts). Then we let them cool off, sliced and splayed them out on a big serving dish and plonked a mound of salad in the middle – plus redcurrant sprays, currently in full flow in the garden. 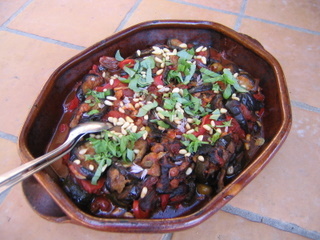 With that we did a cooked veggie dish that’a a cross between ratatouille and caponata siciliana (rataponata? or capotouille?) – all the usual suspects are present (aubergine, courgettes, onions, peppers, tomatoes) plus raisins for a sweet touch, capers and olives for some salty notes and toasted pine nuts for a bit of crunch. Beautiful to behold (black, red, green) and gorgeous to eat, warm or cold. With an eye on summer (still hoping it will come) and stuff that needs minimal cooking/attention, the no-cook couscous with citrons confits and toasted almonds went down well – just pour boiling water and stock cubes over it, cover with clingfilm, leave to absorb the water, toast some almonds and chop the lemon peel very finely, fork it all up with loads of lemon juice, olive oil and mint… et voilà! 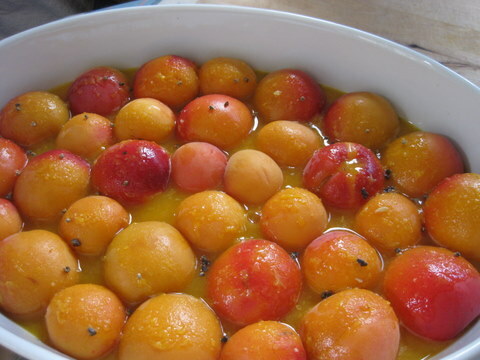 The finishing touch came from a recipe plundered shamelessly from Stella Wrightson, which is one of my all-time summer faves: apricots are halved, set face down in a dish, sprinkled with cardamom seeds and raw sugar, splashed with orange juice and baked till barely tender. The juices are boiled down a little to reduce and concentrate, poured back over, and the fruit chilled for serving. To go with them there’s a yummy mixture of Mascarpone beaten together with light cream and sweetened (or not) to taste. Intense fruit flavours, nicely tart with a hint of the Middle – or even Far – East. For detailed instructions, click on Recipes, then select the relevant section (Soups, Poultry, Fruit Desserts etc.) from the drop-down menu. Scroll on down till you find what you want – or use the search button. Workshops resume Friday 28 September, with a celebration of late-summer veggies (plus gorgeous gluten-free recipes). See you there!